“Wake up with (a flushed looking) Toolan in the morning”. I’d rather not but whose that filly next to you? Here at Mugspotters we love our radio but it’s strictly 6 Music with a side-order of Danny Baker washed down with a shot of Talk Sport. 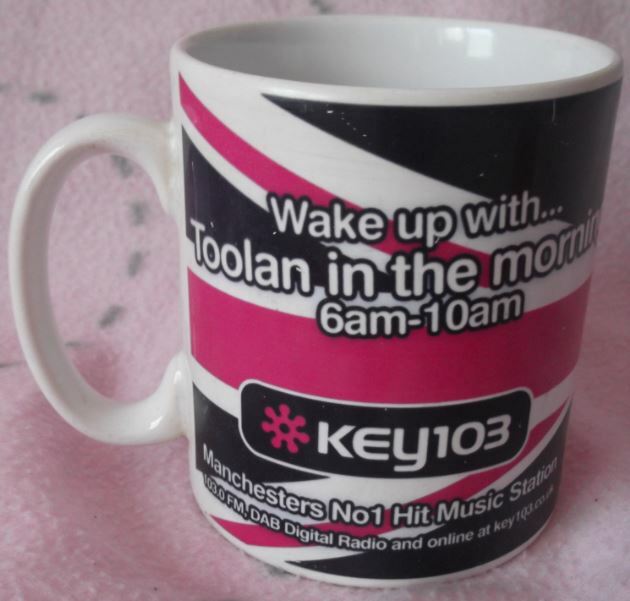 Key 103 is one of many brain-dead pop radio stations clogging FM & DAB and it’s pretty much a straight clone of Capital Fm or Kiss Fm or Whatever FM. If you flick round the dial and switch between any of these dreck-fests (not advisable if you’re driving) they play largely the same utterly woeful bilge on rotation, such as Rhianna, Calvin Harris, Bruno Mars, David Guetta et al. Sorry, I’ve just had a sick-up. OK, I’ve skirted round the obvious here. We sailed pretty close to the wind with our recent Cho-Cha.com post where it was strictly silhouettes but here we can actually see ‘lingerie’. Mugsploitation is something we need to stamp out and hopefully this tawdry & gaudy Cambridge will further ram the message home. Just one last thing. I think there’s a misprint on the mug strap line. I’m pretty sure ‘Hit Music Station’ starts with an ‘S’.